Objectives: Increase consumer engagement and drive repeat website visits and conversions. 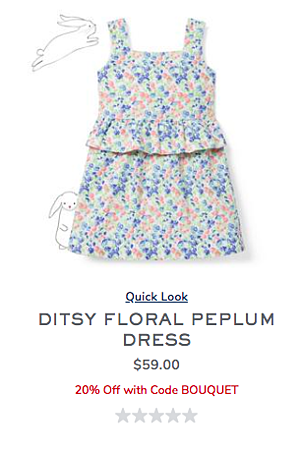 Janie and Jack, a global leader in children’s fashion, is making Easter a little sweeter this year with their “Find the Bunnies” sweepstakes with See’s Candies. Leading up to the Easter holiday, Janie and Jack have hidden little bunnies inside the product pages of some of their Easter styles, and have challenged their fans to find as many as they can for the chance to win a variety of prizes. From now until April 15, fans will be able to enter Janie and Jack’s digital Easter Bunny Hunt by visiting their website, finding as many as they can, and submitting the number of found bunnies on their microexperience landing page HERE. One lucky winner will be announced on April 16. 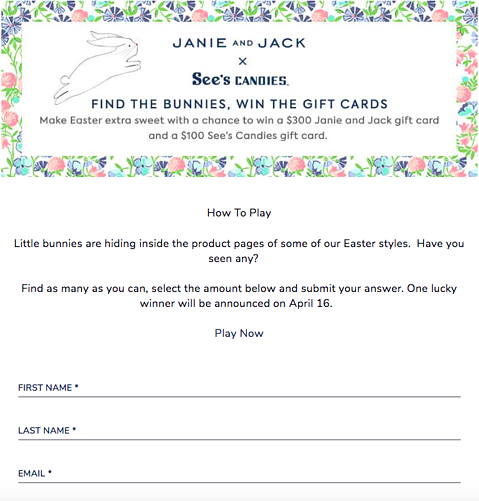 Janie and Jack’s Easter Bunny treasure hunt is a creative way to keep consumers coming back and clicking on more of their website and product pages in search of bunnies and some seriously amazing prizes. You can Spring into action and see how many bunnies you can find HERE. Janie and Jack’s DCI score of 100 is a clear reflection of some smart choices to increase their campaign’s engagement score. The team is crushing engagement with a current Engagement Score (ES) of 200. Build a campaign that encourages repeat visits and clicks. Janie and Jack did an amazing job of building a unique and creative sweepstakes that encourages consumers to keep coming back to their website in search of bunnies and new prizes. Gamifying your marketing activities is a great way to encourage consumers to participate and engage with your brand on a deeper level. Use a microexperience to guide your consumers. Outside of being a fun and engaging experience for consumers, Janie and Jack’s Easter bunny hunt, was a clever way to guide consumers through their Easter product offerings, highlighting top priority items and strategically guiding consumers through their website. For more campaign inspiration and real-world examples of leveraging microexperiences to collect self-reported data, download our best of 2018 lookbook HERE.